Drones have widely been used overseas in war and surveillance efforts, but now they could make an appearance closer to one’s house. Alastair Leithead of BBC, reported that while the U.S. has thousands of drones in use and spends billions in their development, it is still looking at ways to advance the drone race. 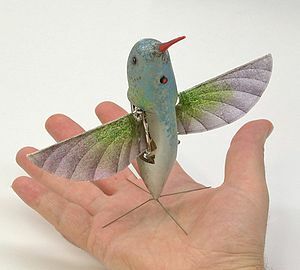 The “drone race” Leithead references is what has led to the development of the Defense Advanced Research Projects Agency‘s Hummingbird drone. DARPA developed the drone through its Nano Air Vehicle program, which develops small, ultra-lightweight air vehicle systems that are capable of performing both indoor and outdoor military missions. DARPA said these drones would be “revolutionary in their ability to harness low Reynolds number physics, navigate in complex environments, and communicate over significant distances” and Leithead reports police in Los Angeles seems to agree. New regulations would allow the police to use small hand-held drones like the Hummingbird and Wasp. The LA police see this as an opportunity to see in places where they usually can’t go due to safety concerns, Leithead reports. According to DARPA, these small drone can be used to dart through an open doorway, for example, and capture real-time video. The agency sees these technologies as giving war fighters an unobtrusive view of threats. The agency also reported that drones like the Predator, which is reportedly being used to patrol the U.S. borders, and the Global Hawk are widely deployed. Recent reports highlighted a larger Boeing-build Hummingbird drone for its 1.8-gigapixel camera and ability to hover like a helicopter. It seems whether drones are large or small, they vehicles may increasingly appear here at home.